A story ran in the Foxboro Reporter a few weeks back that I read with great interest. Allison is a 14 year old Foxboro student volunteering this summer in the maternity department at Sturdy Memorial Hospital. She is one of sixty teen-agers participating in a program that allows them to help out the medical staff, learn, and make friends. Some volunteers even work with the patients. The program has had a very positive effect on many of the students, particularly Allison, who even heard the first cries of a newborn baby. My interest in this story comes from the fact that I worked in a hospital for five years, and no job before or since has had such an impact on me. Yes, it’s a cliché, but it changed my life. 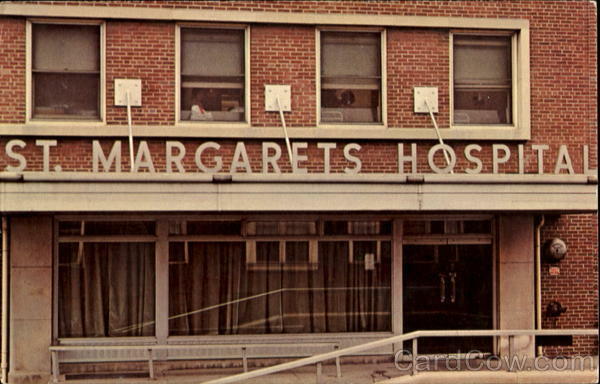 Saint Margaret’s Hospital in Dorchester was, in its time, the largest maternity hospital in the United States, with a proud century of providing excellent health care for mothers and newborns, as well as offering the Saint Mary’s residence for young mothers who had nowhere to go. My association with Saint Margaret’s began during my last year of high school, when all seniors were required to perform three months of community service prior to graduation. I drew Saint Margaret’s and my assignment was with two other guys from high school; we’d be working in the Intensive Care Nursery (ICN), where the highest risk babies were taken after birth for critical care. Some of the infants had infections, some had respiratory problems, but most were “preemies,” that is, they were born anywhere from one to sixteen weeks prematurely. I recall that during my initial tour of the nursery, I was in awe. Some of the babies were so small that the length of their arm was just about as long as my pinkie finger. Most were hooked up to monitors, with various tubes and wires connected to them. Some even had tubes down their throat to breathe for them — a process called intubations or mechanical ventilation. It was a frightening sight, but each connection was in some way helping this fragile newborn fight for life. From day one, I was asking all kinds of questions. How do you feed a baby that small? What’s an arterial blood gas? Why is that a “bad” electrolyte reading? What is this monitor for? What’s hypoxia? What’s the difference between Heparin and Lasix? I found that the nurses and doctors were more than willing to answer my questions. I helped out in any way I was needed, from stocking the cabinets to running to the lab to cleaning to picking up blankets for the nursery. My days were full with many responsibilities and learning experiences. 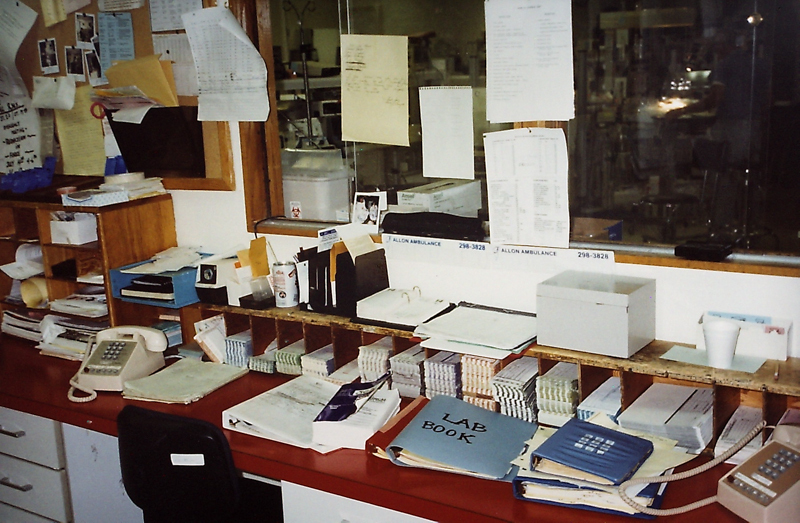 I was soon asked to help out at the desk, a very responsible position that involved answering phones, taking lab results, helping to admit and discharge babies (a mountain of paperwork went with those) and other tasks. 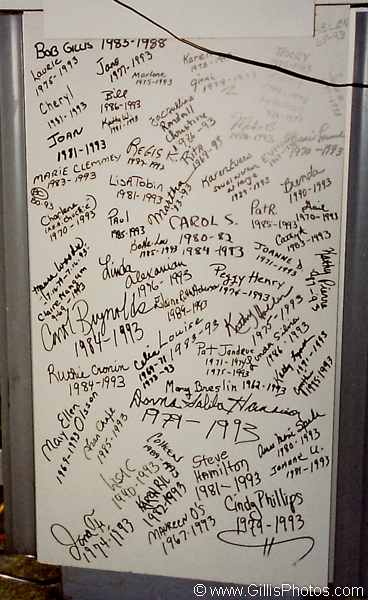 Before Saint Margaret’s Hospital closed in 1993, many employees, past and present, wrote their names (and dates of service) on a board in ICN, which I believe is still on display at Saint Elizabeth Hospital to this day. 25 week twins coming in! Page blood bank, stat! Type and cross match! Call radiology for a chest film! In three months, I literally saw life and death, with the tragic passing of a tiny baby too sick to live, and soon afterward I was witness to an actual birth. I remember that newborn baby, how pink she was, and that she weighed a healthy seven pounds. Seeing a baby actually born was amazing. It’s an experience you never forget. Before my three months were up, I was offered the opportunity to take a regular paid position as a clerk and aide, a job I accepted and kept for five years. I got to feed babies, work the desk, keep the place clean, and learn a lot. I also grew up a lot. I remember the parents — terrified by the sight of their tiny baby in an incubator or attached to a respirator — who were treated with compassion and respect, and lovingly reassured through words and action that their child was in the best possible care. Working tirelessly in a high stress environment, the nurses and doctors continuously strove to preserve the lives of these delicate newborns. ICN was much like “ER,” in that a baby could arrive and in seconds a medical team was gathered around the infant. Sometimes a high risk baby might “code,” that is, the baby’s heart might stop or it might stop breathing and the team rushed to stabilize him. Many of the babies were critical. Most were very sick. I remember the vigils kept by nurses over very sick babies, often long past the time the shift was over. I remember the feeling of sorrow and despair when a baby didn’t make it. This wasn’t a statistic — this was a little friend. But thankfully, the miracles far, far outweighed the sadness, and I witnessed a lot of them. Little Alicia, for example, weighted just over one pound when she was born — and returned with her parents to one of the nursery reunions as a healthy toddler a year later. I remember many such success stories. The nursery received hundreds of Christmas cards every year containing pictures of healthy children who’d all “graduated” from ICN. Despite the life and death seriousness of the unit, despite the occasional personality conflict and office politics present in every work environment, I have nothing but good memories of my time at ICN. 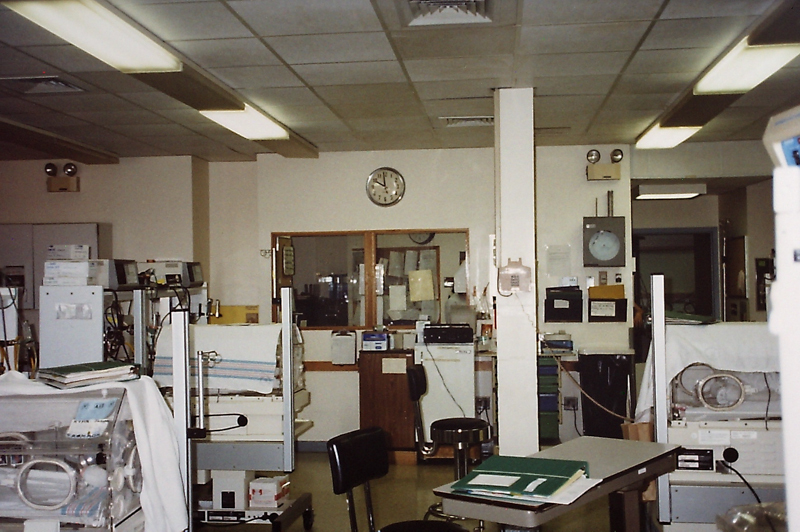 The nurses, doctors, clerks, and aides were all professionals who took pride in their work, and it showed. When I think back to ICN, I think of the professionalism, the daily miracles, and most of all a very real sense of family. I remember the satisfaction and belief that my job was important because I was helping people who were saving babies lives. My experiences took place over several years, but it all started because of a program very similar to the one Allison and her friends are now enrolled. I sincerely hope the program continues, because even if a person has no intention of entering the medical field, any work in a hospital situation will bring many benefits. It teaches how to manage a stressful work situation. It teaches responsibility. It teaches what is really a priority in life, and how precious and fragile life can be. And that is one of the greatest lessons anyone can learn. So many memories at this desk. What years did you work there? I was born there, wondered if maybe you remembered my parents.